As a fitting follow- up to its much-acclaimed musical adaptation of C. S. Lewis' THE LION, THE WITCH AND THE WARDROBE, TRUMPETS proudly presents THE HORSE AND HIS BOY. Based on one of the books from Lewis' THE CHRONICLES OF NARNIA, THE HORSE AND HIS BOY is the tale of an orphan boy, Shasta, and a talking horse, Bree, as they journey towards freedom from oppression and slavery. They fly from a foreign land to Narnia, the place the horse calls home, and where the boy hopes to find who he is and where he truly belongs. Along the way, they are joined by a young noblewoman, Aravis, and a talking mare, Hwin, who both share their desire for freedom. Together they embark on a grand adventure through deserts and mountains, risk near capture, encounter danger, face the unknown, take part in a battle and, finally, find themselves and their destined place in the sun. Reconnect with beloved characters from THE LION THE WITCH AND THE WARDROBE – the grownup Susan, Edmund and Lucy now reigning monarchs of Narnia , the faun Tumnus and, of course, the Great Lion, Aslan, and meet many new colorful and fascinating characters. 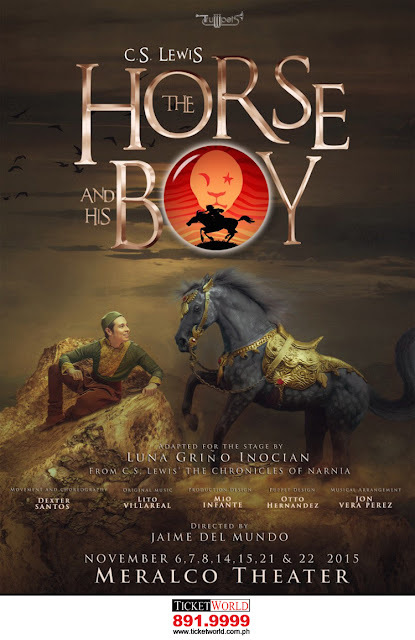 In the words of Director Jaime del Mundo, THE HORSE AND HIS BOY will be something totally new and exciting as it will "look like a musical, feel like a musical, have music plus a song or two but will not be a musical." Join TRUMPETS on this new adventure - a non-musical adaptation of C. S. Lewis' beloved book, THE HORSE AND HIS BOY.